A group of very generous community members, led by Mr. Mike Socci, have donated time, money, labor, and materials to construct a new concession stand at the location of the current concession trailer at Pisini Field at Franklin High School. 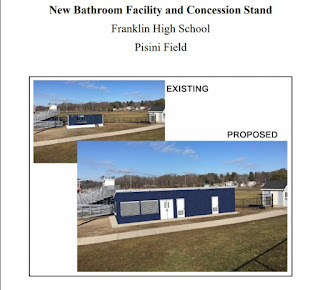 This project received School Committee approval in December, pending sufficient funding. Significant fundraising efforts have yielded the necessary funds and the project is moving forward, beginning over April vacation. We are very excited about this project. The current trailer will be replaced at the current location with a new building with improvements in the kitchen for serving concessions at events. Additionally, the facility will include bathroom facilities. We are very grateful for the generous donations. Within the next few weeks, community members can expect to see materials being removed from the trailer, its demolition, and the construction of a fence around the construction area. Construction will continue this spring, with some small projects occurring on weekends, when school is not in session. The majority of the work, however, will be completed over the summer, after school gets out. We anticipate that this will have little impact on our school or our summer programming. All workers, as we do with every construction project, will have verified CORI checks for safety. Please contact the Superintendent's office, if you have any questions. Have a safe and restful April vacation.